Today I want to share with you the pieces of clothing that I’ve bought on the Summer sales. Most of this pieces are really affordable just in case you want to buy them. The first piece of this haul is this red playsuit from Bershka. I usually spend all the Summer wearing dresses but I also love to go everywhere with my bike and this is a difficult combination. That’s why I’m starting to buy more playsuits. I love the red colour on this playsuit and that it’s fitted on the waist. I think it’s price was around 10 €. The first piece that I bough in H&M is this bodycon dress. I liked this dress because it wasn’t very short and I think the two black stripes that it has on the sides are very flattering for the body, they give the illusion of being thinner. The price of this dress on sales was 7€. Another piece that I also bought in H&M is this cute sweatshirt. I like the length of the sweatshirt because it has a longer length but you can turn it around and make it cropped. But the thing that really drawn me to it is it’s confident message. I think that nowadays many people is lacking of selfconfident, but I believe people should love themselves just the way they are. The price of this sweatshirt was only 3€. Finally from H&M I bought this pair of trousers. I love them because they are high waisted but they also are stretchy so when you sit down they are still very comfortable. For me it’s really difficult to find a trouser that fits my thighs and my waist at the same time. Therefore, when I tried on these trousers and realised that they fitted perfectly I couldn’t be happier. The price of this pair of jeans was also very convenient because it was only 7 €. 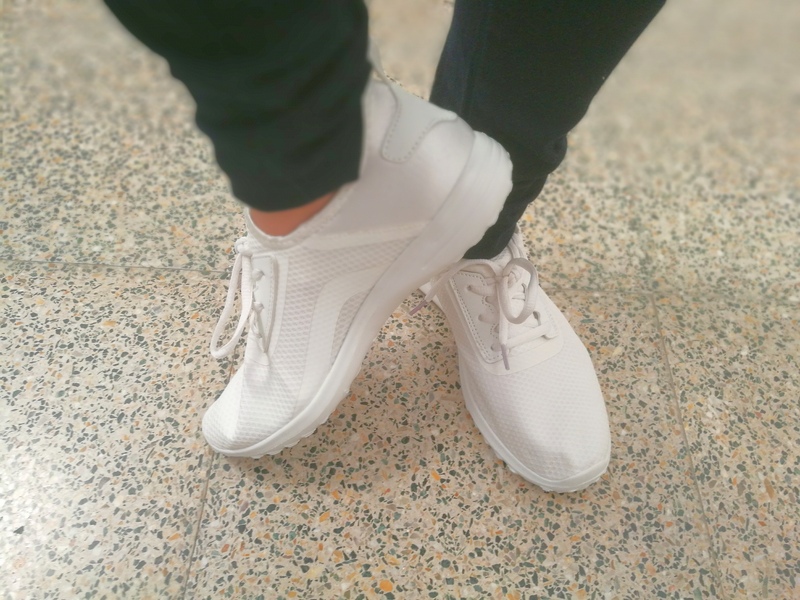 In Primark I bought this pair of white sneakers. If you know me you know I’m all about comfortable shoes, but I never though Primark shoes were this comfortable. So when I tried them on I was pleasantly surprised. Another thing that I love about these sneakers is that they are all in one colour, which I believe they make them more elegant. The price of this sneakers was 5 €. Then I bought this black lace dress from Zara. Sadly in the picture you can’t see the lace properly. I liked this dress because it reminds me of the Dolce and Gabbana typical dresses. I know I repeat myself but I love this dress because it’s tight but it also has a knee length. The price for this dress was 12 €. Finally, from Stradivarius I bought this crop top. Right now, this kind of stretchy fabric is in fashion again, I remember it was on fashion on the nineties. The style of this top is usually shorter and it usually comes with an off the shoulder style. The price of this top was only 3€. Is it difficult for you to find trousers that fit you perfectly? Did you buy anything on this sales? I see why you like denim. You look really good looking in it, but you’re mixing it up with a different texture and contrasting color for the shirt. So pretty!! Red is your color! Red is every woman’s colour if she knows how to carry it on her body. All of the outfits look so good on u! Great post! I love your style, you pull everything off so well! Love this post! I like everything you bought! That H and M dress is such a stunner! I love the print and the fact that you can wear it for work and play! the jumper is so nice! That H and M apparel is such(a) a stunner! ! Hi! I really need your help. My friend has applied for a position in a DG store and now she is going to prepare for the interview (fashion shop assistant position). Can you give me a helping hand? What kind of questions can they ask? Love! The Confident sweater is super cute! I love it! H&M always have good deals. The haul is great! Great post! Love the little red romper on you! Super cute finds! All of these look so good on you. Thank you 🤗🤗 I also have that problem.. So many cute items girl! OMG!!! I LOVE THESE CLOTHES!!! You’re a great shopper; low prices and high style. You looked great in everything!